We spent over four years in Germany. Our PCS (military relocation) back to the US was my 30th move. (I’ve told that to anyone who would listen, btw) There should be an award handed out to veteran movers such as myself, who racked up 12 moves before graduating high school, then kept going. There is beauty in the most challenging of moments. It waits to support us, if we let it. Here’s an easy example. Our final few days in Stuttgart were rushed, exhausting and full of goodbyes. I took this from my balcony on our last night in our little rental house. Tucked behind a grand mansion, the house was in need of some love, called the Putzfrauhaus (servant's quarters) by the neighbors. With views like this, we didn’t mind. Taken from the window of our little rental house on our last night in Stuttgart. 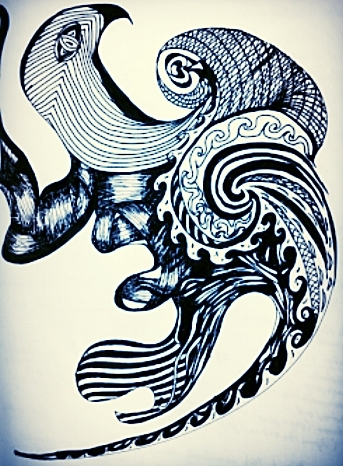 So I closed my eyes and drew squiggle lines all over two pages in my journal thinking, “Today, I go big.” That was three days ago, and the doodle is only half done. The left page is buck-naked save for the original squiggles…feels like it wants to be a wing or something. I got this far, but the second half is mostly blank. Do you ever lose the thread? Historically, I don’t self-identify as an artist. Give me numbers to crunch, and I’m your girl. Fiction? Tough going, but in my wheelhouse. In my 20’s, I tried to improve a deficiency and read The Natural Way to Draw, by Nicolaides. While the book (which I highly recommend, btw) freed me from my need to judge progress, and I improve visual perception, and learned enough technique to copy to a reasonable degree, I never developed the ability to “see” images that weren’t right in front of me…i.e. I can copy, but not create. Drawn by PK from a face in a National Geographic magazine. Again, I’d be more specific but the magazine is long gone. Proficiency in reproduction is not the same as the ability to execute a creative vision. When I write, for example, I draw inspiration from outside sources, but the finished product is not a reproduction. It feels authentically mine. Except, at the moment, I’m stalled along the side of a dirt road waiting for a spark of inspiration. I’ll post an update when the situation changes. I write about soldiers and warriors, their families, wartime situations, clashing nations. Over the years, research has taken me down many philosophical and psychological roads in my attempt to get inside the minds of my characters. Never has a book affected my view of a subject so drastically so quickly as Sebastian Junger’s short work. Tribe has a simple premise: soldiers returning from war zones attempting to reintegrate into “normal” society—as riddled with issues as they might be—are not the problem. Modern society is the problem. Cautioning us against the impulse to romanticize past tribal cultures, who “waged war against their neighbors” and practiced “deeply sickening forms of torture,” Junger nonetheless compares our modern hustle to the trials and hardships of tribal life and questions our longstanding beliefs that modern society is uniformly better. Soldiers returning from battle might have experienced the closest modern society comes to living within a tribal unit. During their deployments, at the most heated of times, their individual contributions are necessary for the survival of the whole. Their conduct has a direct effect on the lives of other men and women who live in close proximity for long periods of time, i.e. their behavior affects people who are not strangers. The burden of hardships and dangers and tragedies are carried by the group and the group members form a common understanding. Then these soldiers return to a society that can’t relate. The average civilian can’t accurately image the violence, depravity, and basic discomfort of living within a war zone. We also can’t imagine the cohesive bonds or the uncomplicated sense of immediate purpose. Our lack of understanding the positives—as much if not more than the negatives—of serving within conflict, can contribute to the soldier’s strong sense of isolation. This simple but profound (for me) idea has already had an effect on my writing. It might take years for me to fully explore the ramifications for my relationships with the soldiers in my life. It’s not my intention to get into the book review game, but Tribe can be finished in an evening and is well worth the time. Four days of a set writing schedule. Am I making forward progress on The Stone Eagle? Who knows? But I completed a second doodle drawing along with a few sketches. PK Doodle #2 - Anyone want to tell me what they see? The advice in the doodle video (Peter Draws) was to start with a random few marks and let your mind (and pen) fill in what it wants. Sometimes it turns into something, sometimes not. Anyone want to tell me what they see? My first attempt at doodle drawing. Don’t ask me what it is. I found this quote in the introduction to Larry McMurtry's Lonesome Dove. Funny enough, it never occurred to me to look to the classic western for inspiration, but there it is. The Stone Eagle Series is frontier fiction--traditional values/lifestyles clashing with modernization in a lawless land. It shouldn't have been a surprise. There are horses and "shoot-outs" (albeit with swords and bows and arrows); weak struggling against strong; make-shift systems of trade; and, above all, a question. What does it mean to live with honor? My thoughts on bullies and heroes, hard times, and an old (semi-confusing) line of advice. My Brother's Book Just Went Live on Amazon!! As of today, The Dublin Hit (Book 1 of the Sauwa Catcher Series) is for sale on Amazon. Isn't the cover stunning? A big thanks to the talented Louis Rakovich at Indigo Forest Designs. It’s 1994. The Apartheid in South Africa has abruptly collapsed. Covert operations specialist, Sauwa Catcher — once a reluctant but lethal soldier in the fallen regime — finds herself without a country. Branded an international criminal and targeted by multiple intelligence services, Sauwa is a fugitive, alone and on the run. An Irish paramilitary organization offers her a deal: carry out a dangerous, hands-on assignment in exchange for money and the means to disappear. 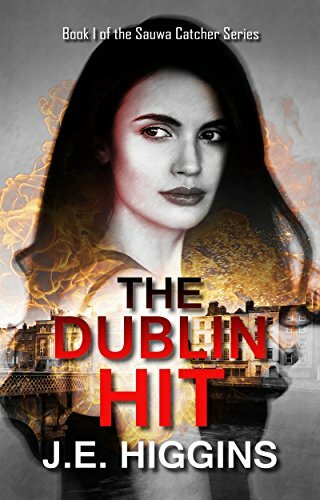 On the gray streets of Dublin, she plots what she hopes will be her last mission while evading ruthless IRA hitmen, who will stop at nothing to see her dead, and intelligence agencies intent on publicly trying her for the crimes of a corrupt regime. Sauwa must use her combat-hardened operational skills and razor-sharp instincts if she is to fight and survive in her shadow world. The Stone Eagle: Episode I is Live! I hit "publish" yesterday and the first book of my YA historical action/adventure The Stone Eagle: Episode I is now available on Amazon, iBooks, Kobo, Nook and many others. Click below to check it out on Amazon or Kobo. After three years of writing and talking and sharing stories around a kitchen table, The Stone Eagle: Episode I -- my YA Historical Action Adventure Series -- is days away from publication. Look for the ebook to go on sale on Amazon, iBooks, B&N's Nook, Kobo and others on 10/5/17. A print edition will be available within the next two weeks. For those of you who have read early drafts, critiqued and given encouragement, thank you. A long sword from the Late Roman Empire. The blade measured around 30", allowing greater reach than the traditional gladius, as the legions began to rely more heavily on cavalry.